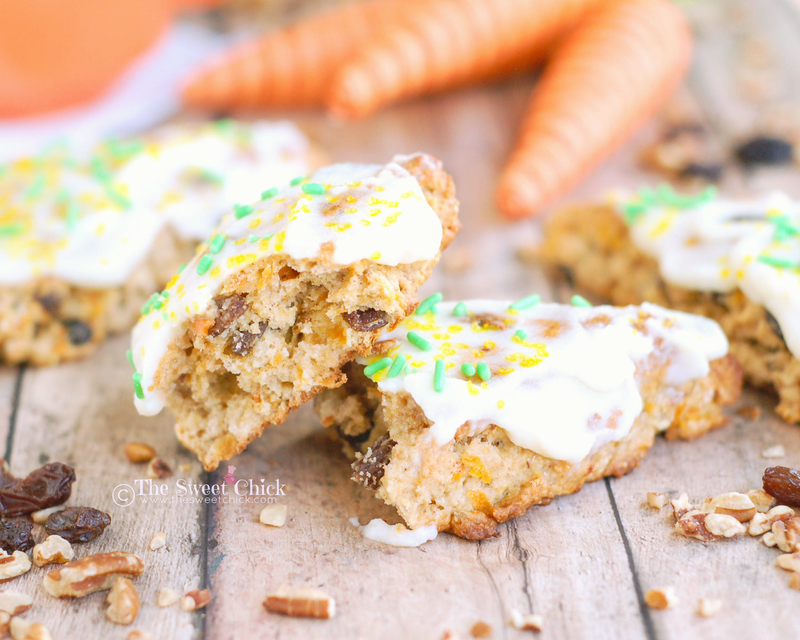 The scones do taste a bit like carrot cake, but just not as super sweet as carrot cake. At least the one my mom has always made is very sweet. I don't know about yours. No my hands are not that tiny. I enlisted my daughter to grate the carrots. She wanted to help out. I made them the traditional way. 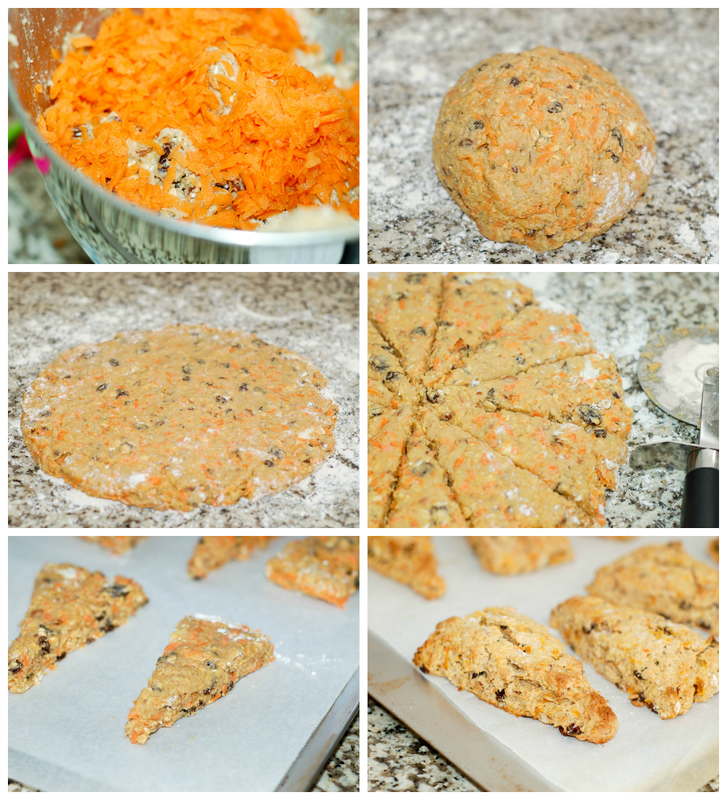 Rolling out the dough and cutting them into triangles, but you can also just use a large cookie scoop (ice cream scoop) and make them round like I did for my Orange Basil Scones, Cranberry Ginger Scones, and Lemon Blueberry Scones. The dough was a bit sticky, but workable. I didn't want to add too much more flour because, they would become too dry. I just dusted the top lightly to roll it out and cut the shapes. To top these beauties, I made a simple mascarpone glaze. I really love mascarpone cheese if you haven't noticed. 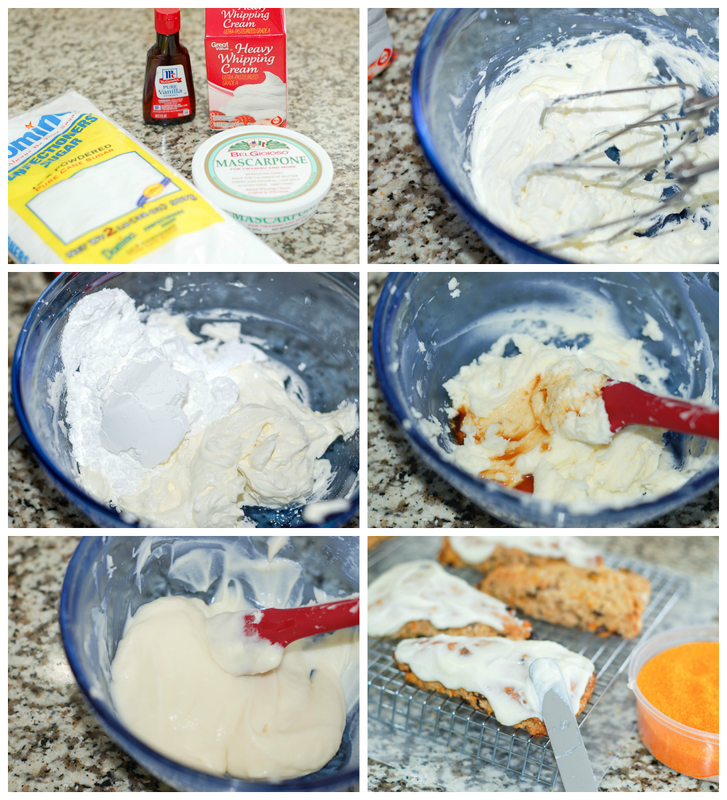 I think it tastes better than cream cheese, but if you want to make a cream cheese glaze, go right ahead. 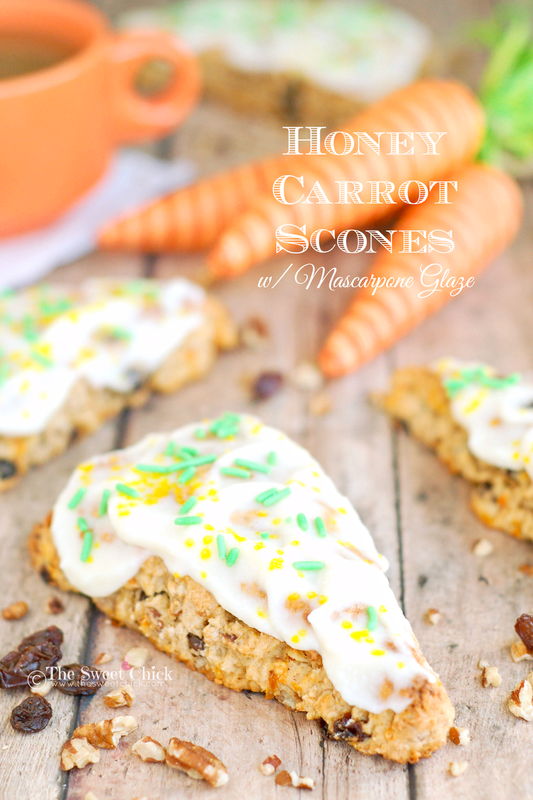 I love how rustic these Honey Carrot Scones came out. You can see all the bits of carrots and the speckles of cinnamon and nutmeg. The texture of these scones was spot on. They are crumbly, but not too dry. They are just sweet enough, especially with the glaze. And they have a vegetable and a fruit inside, so you can kinda call it healthy. These will be a great break in between all the chocolate bunnies you will be eating on Easter day. Hope you all have a Happy Easter! 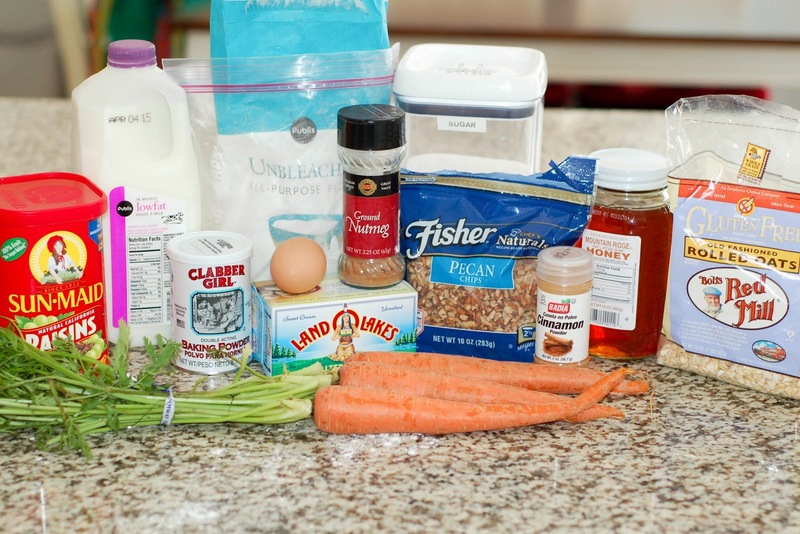 In a stand mixer, mix flour, sugar, baking powder, spices, and oats, until well blended. 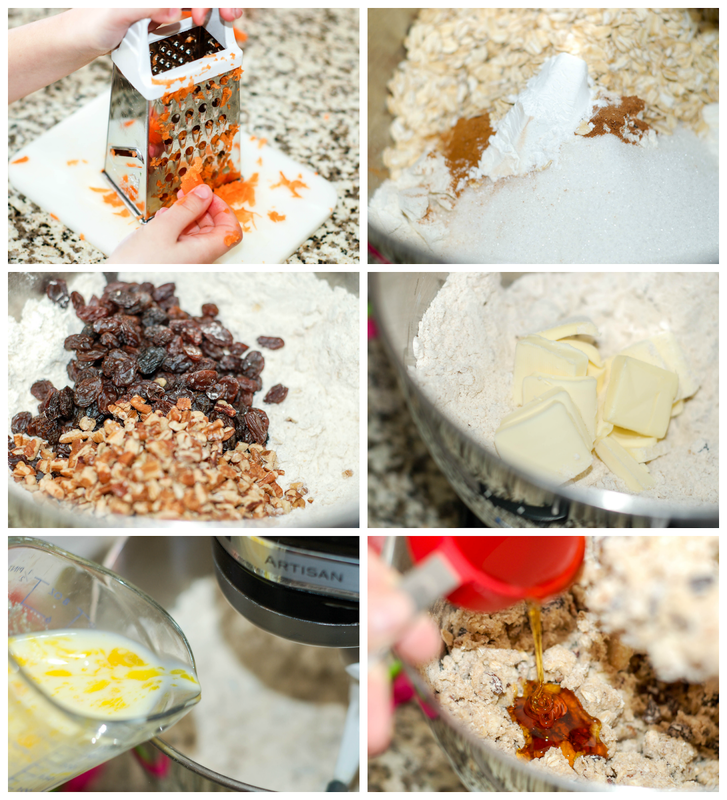 Then add the raisins and pecans and mix well. In a small bowl/measuring cup mix egg and milk until blended and add to the flour mixture. Then add honey and mix on low speed until fully incorporated. Lastly, add the shredded carrots and mix until evenly distributed. Remove dough from the mixer and roll into a ball. The dough will be a bit sticky, but manageable. Place the ball onto a lightly floured surface and flatten out to about a 10" circle. Sprinkle with a bit of flour to help flatten it out, just don't overdo it. With a knife or pizza cutter, divide the dough circle into 12 equal triangles. Separate the triangles and place on a parchment lined cookie sheet. Bake at 425 degrees for 13-15 minutes or until tops are golden and a toothpick inserted in the middle of the scone comes out clean. Remove from the oven and allow to cool before glazing. Place the cheese in a small bowl and beat with a hand mixer until fluffy. Mix in the sugar by hand until smooth, then add the vanilla and mix until well combined. 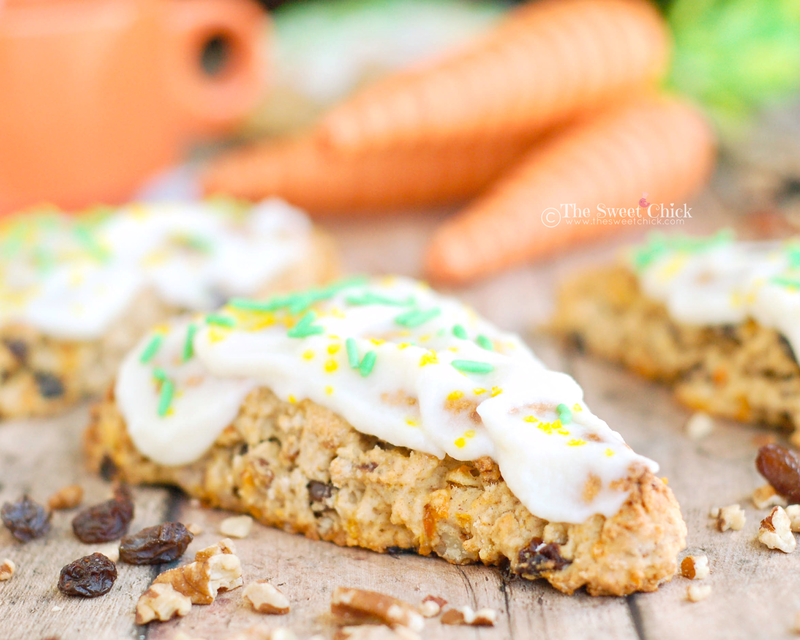 With a spatula, spread the glaze over each cooled scone and enjoy! You can add festive sprinkles or colored sugar if you like on top of the glaze. If you are making the scones ahead of time, wait till you serve the scones to add the glaze. These look absolutely phenomenal! I can’t wait to try them. I love how you’ve only incorporated. help with assignment. 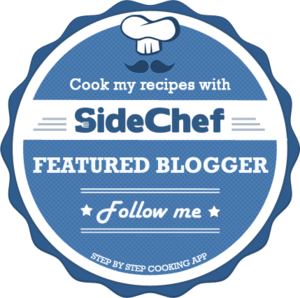 Of butter into this recipe, too. I can’t wait to make these. My sister is an avid lover of scones, so I’m sure she can’t wait either.